Louis Van Gaal needs to secure Champions League football this season or the club could be faced with massive financial problems. AFTER PRESIDING OVER the second biggest summer outlay in football history, perhaps Louis van Gaal has overestimated Manchester United’s spending power. The Dutchman has, somewhat belatedly, realised the size of the task on his hands at Old Trafford and hopes to spend another €60 million on defenders this January, on top of the €190m lavished on six players over the past few months. Ander Herrera, Luke Shaw, Angel Di Maria, Daley Blind, Marcos Rojo and Radamel Falcao arrived at Old Trafford in a spree that is dwarfed only by that of Real Madrid in 2009, when they twice broke the transfer record to buy Kaka and Cristiano Ronaldo. And it seems Van Gaal cannot believe his luck: “My start at Bayern was just as bad as my start with Manchester United,” he told De Telegraaf earlier in September. “But the big difference was that at Bayern I had already been called in for a major showdown with Uli Hoeness, who wanted an explanation. Van Gaal insists it is a show of support from the Old Trafford money men, but when does that support start to become irresponsible? There is concern in the United boardroom about the impact of further outlays on next year’s financial results. Almost two weeks ago the club announced a record annual revenue of €550 million to June 30, 2014, an increase of 19 per cent, plus profits of €30m. But only the signing of Ander Herrera was included in those figures. The rest, around €152m, will count towards next year. “Amortization of players’ registrations”, including Herrera, Juan Mata and Marouane Fellaini, stood at €70 million, an increase of 32.6%. According to the Financial Times, it will rise to €126m. The club have also forecast a 30% drop in profits in the next set of accounts, due in part to absence of Champions League football this season. And that sizeable drop is be a best-case scenario. It is based on Van Gaal leading Manchester United to third in the Premier League. Failure to secure Champions League football would signal further losses. It now leaves the club weighing up the pros and cons of yet more spending in January as Van Gaal prepares to meet Ed Woodward this week to hammer out the club’s next moves in the transfer market. Woodward, the executive vice-chairman charged with negotiating United’s dealings, faces a dilemma. In a conference call with Wall Street investors he revealed that the club “do not intend to significantly increase capital expenditure in January” – clearly, he is well aware of the impact of further spending on next year’s precarious accounts. But he also knows United’s existing commercial agreements will be impacted by a second season without Champions League football, which would have its own ramifications on the next set of fiscal results. 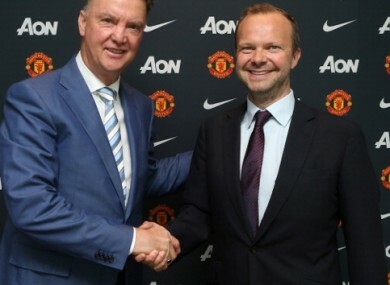 Van Gaal, as he has already demonstrated, is willing to let players go in order to fund his new era. After Danny Welbeck and Shinji Kagawa were shown the exit door permanently, and with Tom Cleverley, Javier Hernandez and Nani not expected to return from loan deals, more departures are on the cards. In fact, Aston Villa have an option in Cleverley’s loan deal which offers them the chance to buy him up front in January. Rafael’s position at right-back is in the balance, while Chris Smalling could also be offloaded to free up space and funds for a new central defender or two. Anderson will be moved on as soon as the club can find a willing buyer, but that’s proven to be no easy feat, while Marouane Fellaini can go if somebody goes one step further than Napoli and offers more than €12m up front. Just a couple of those sales would surely loosen the purse strings, though even if the club want to buy they might face a struggle. Mats Hummels is the centre-back of choice, but United were met with stern resistance from Borussia Dortmund in the summer. The Germany international could be tempted into a move at the end of the season for the right price, but would almost certainly not abandon his club mid-way through the current campaign. Kevin Strootman, as has long been reported, remains Van Gaal’s first choice and the club are confident of signing the midfielder at some point, although Roma either insist they do not want to let him go at all, or quote silly money in the media. Top-class players are rarely available in the middle of the season, and with the club already wary of spending too much more money there seems little point in using up funds which would be better utilised in the summer. In the United boardroom, too, the prospect of further spending and still a failure to qualify for the Champions League represents a nightmare scenario. Without getting into doom and gloom territory, it could signal the start of a downward spiral with the club increasingly desperate to qualify for top-level European football but with less and less money to do so. Adidas’ record new kit deal, for example, will be worth 30% less should the club fail to qualify for the Champions League for two consecutive seasons starting from 2015-16. These factors, plus more besides, will all be considered when Woodward meets with Van Gaal in the coming days. It is what happens in the next 12 weeks, though, which will surely force the agenda. More than anything, the embarrassing 5-3 loss at Leicester on Sunday set alarm bells ringing regarding the squad’s mental strength. The first 60 minutes, while by no means perfect in a defensive sense, provided further promise of some blistering attacking play, particularly from Di Maria. The game turned on an outrageous penalty decision but the subsequent collapse was unnacceptable – at 3-3 United had opportunities to get a foothold on the match again but completely blew it. Public opinion seems to shift on a weekly basis where United are concerned and, albeit after such an eye-catching loss, it is still too early to predict how they will fare this season, especially considering the mixed results for Liverpool, Arsenal, Tottenham and Everton. But even if they do find themselves struggling in the winter, it may be wise to hold back on the spending. For this financial year, at least. Email “Opinion: Can Manchester United afford to spend their way out of trouble?”. Feedback on “Opinion: Can Manchester United afford to spend their way out of trouble?”.